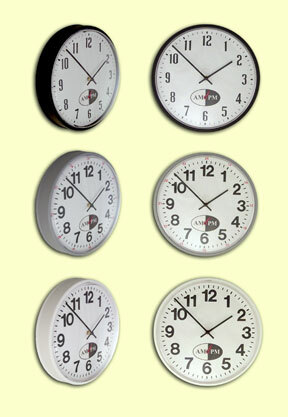 "24 hour clocks or military time clocks - great selection & low prices on all 24 hr clocks. Shipping included!" $47.50 - GROUND SHIPPING INCLUDED when ordering on line! 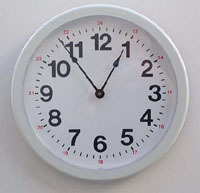 Model PL13.2 AM/PM Round Wall Clock - OUR ULTIMATE TIME KEEPER available only from OfficeClocks. 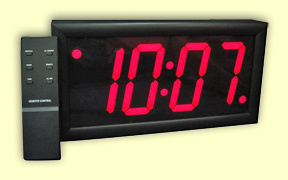 This clock shows regular 12 hour time with an indicator for AM & PM. 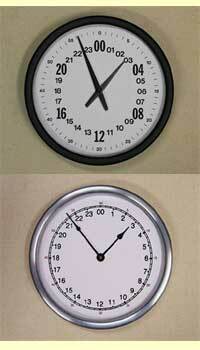 Set it to local time or to a remote location to determine the time of day OR night. Tough acrylic case in black, white or gray, 13 1/5" outside diameter x 2 1/2" deep with convex plastic lens, uses two AA batteries. 69.95 - GROUND SHIPPING INCLUDED when ordering on line! A 24 hour clock with a movement that runs on 110 volt / 60 Hz current OR 1.5V current by it's battery back-up in the event of a power outage. The electric current maintains the power in the back-up battery, on which the clock can run for three weeks without electric current. THE CLOCK IS ALWAYS RUNNING ! GROUND SHIPPING INCLUDED when ordering on line! $129.00 -GROUND SHIPPING INCLUDED when ordering on line! 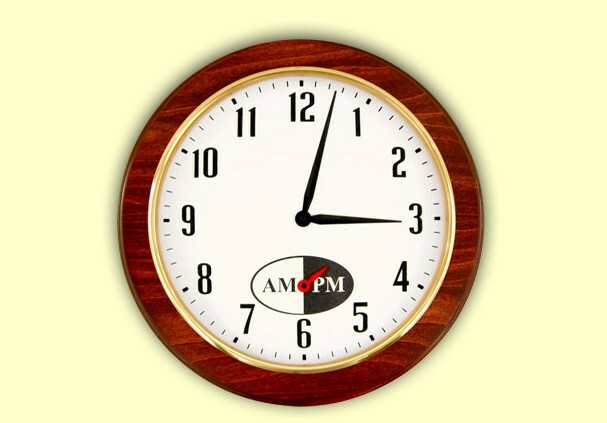 Another of our new creations, a regular 12 hour dial clock with an indicator for AM & PM. Solid American hardwood case, brass bezel, glass lens, 13" diameter, uses two AA batteries. $137.50 - GROUND SHIPPING INCLUDED when ordering on line! 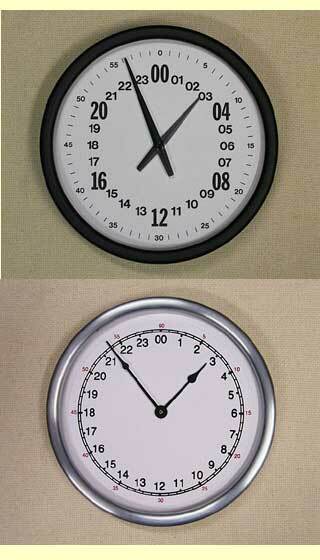 Two clocks in one clock case - 12 Hour & 24 Hour. Eliminates the guess work for those not accustom to using military time. 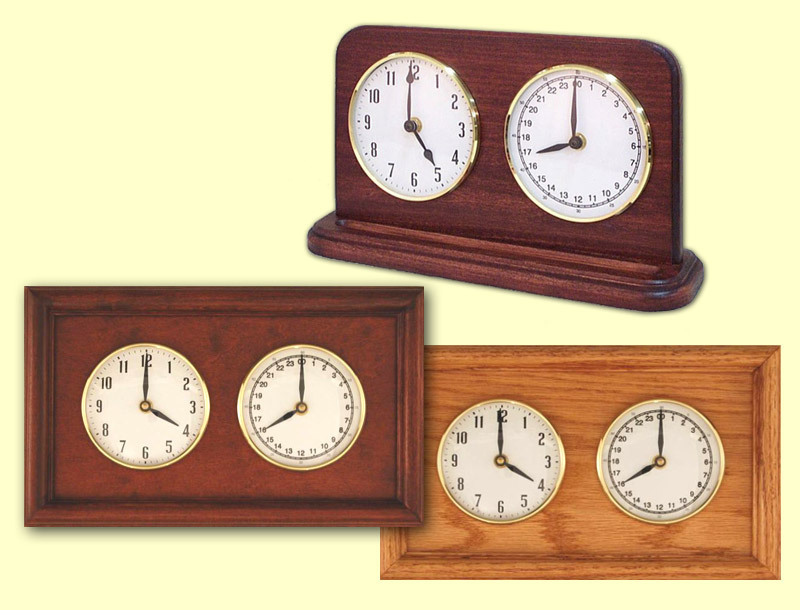 Solid American hard woods; good quality clock parts with 4.5" brass bezels, glass lenses; quartz movements with AA batteries installed and times set to the time zone of the delivery address. 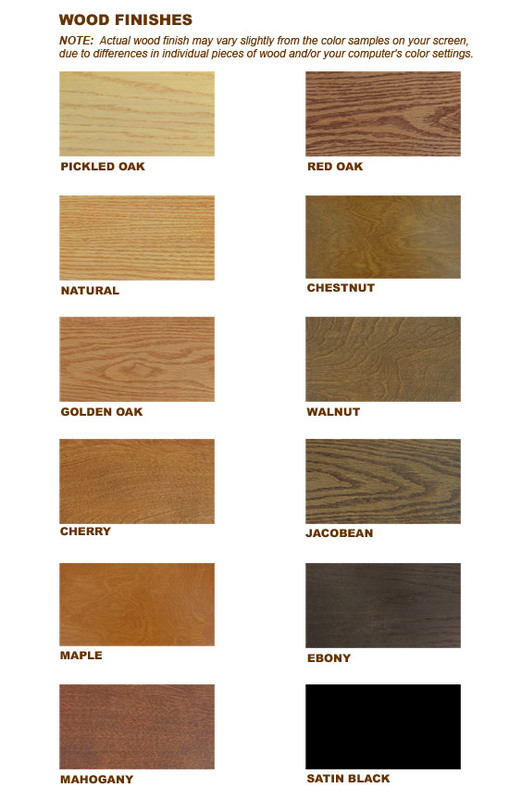 Comes in a choice of 12 different finishes. Case sizes: Mantle clock - 6 3/4" High x 13 1/4" Wide x 3 1/4" Deep. 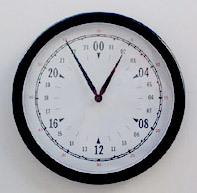 Wall clock - 8 1/2" High x 14 1/4" Wide x 1 3/4" Deep. We custom make each one to order - please allow 1-2 weeks delivery time. $159.00 - GROUND SHIPPING INCLUDED when ordering on line!